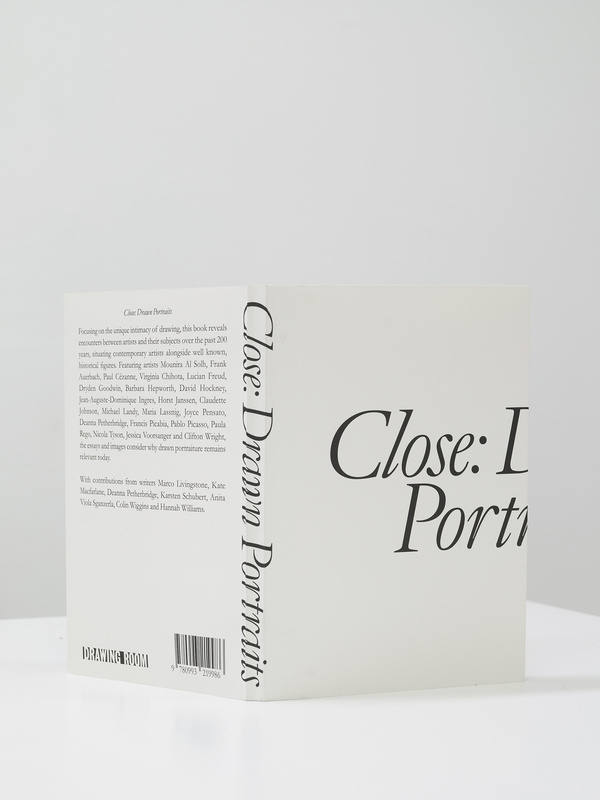 Focusing on the unique intimacy of drawing, the catalogue for Close: Drawn Portraits reveals encounters between artists and their subjects over the past 200 years, situating contemporary artists alongside well known, historical figures. Featuring artists Mounira Al Solh, Frank Auerbach, Paul Cézanne, Virginia Chihota, Lucian Freud, Dryden Goodwin, Barbara Hepworth, David Hockney, Jean-Auguste-Dominique Ingres, Horst Janssen, Claudette Johnson, Michael Landy, Maria Lassnig, Joyce Pensato,Deanna Petherbridge, Francis Picabia, Pablo Picasso, Paula Rego, Nicola Tyson, Jessica Voorsanger and Clifton Wright, the essays and images consider why drawn portraiture remains relevant today. Edited by Kate Macfarlane. Essay by Hannah Williams and texts by Marco Livingstone, Deanna Petherbridge, Karsten Schubert, Anita Viola Sganzerla and Colin Wiggins. 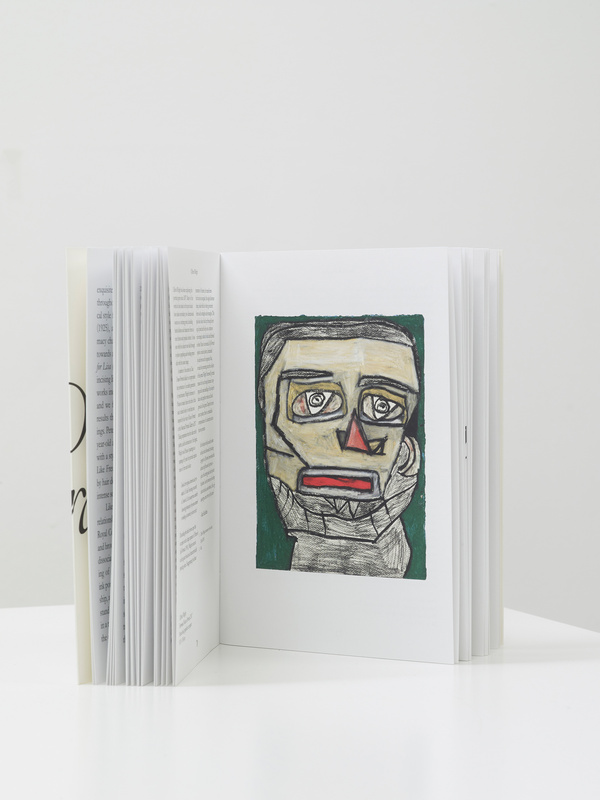 This catalogue accompanies the exhibition Close: Drawn Portraits and was designed by Studio Ard. 112 pages, 47 colour plates and sewn bound. Mounira Al Solh (b. 1978, Beirut) lives and works in Beirut and Amsterdam. Graduated from Gerrit Rietveld Academy, Amsterdam (2006); and Lebanese University, Beirut (2001). Select solo exhibitions include Mounira Al Solh: I strongly believe in our right to be frivolous, Art Institute Chicago, Chicago (2018); Artist’s Rooms, Jameel Arts Center, Dubai (2018); I strongly believe in our right to be frivolous, Mathaf, Arab Museum of Modern Art, Doha (2018); Documenta 14, Kassel and Athens (2017); I Want to Be a Party, Sfeir-Semler Gallery, Hamburg (2016); I Strongly Believe in Our Right to Be Frivolous, Alt Art Space, Istanbul (2016); All Mother Tongues Are Difficult, Sfeir-Semler Gallery, Beirut (2014); NOW EAT MY SCRIPT, KW Institute for Contemporary Art, Berlin (2014); and suddenly there were women, (Performance), Ministry of Foreign Affairs, The Hague and Center for Contemporary Art, Glasgow (2013). Select group exhibitions include Graphic Witness, Drawing Room, London (2017); The Measure of our Traveling Feet, Marres, Maastricht (2016); Everything in Nature has a lyrical essence, a tragic fate, a comic existence, Kunsthalle Exnergasse, Vienna (2016); Es war einmal ein Land, Heidelberger Kunstverein, Heidelberg (2016); Wir Flüchtlinge - Von dem Recht, Rechte zu haben, Badischer Kunstverein, Karlsruhe (2016); and Venice Biennial, Venice (2015). Dryden Goodwin (b. 1971, Bournemouth) lives and works in London. Graduated from Slade School of Fine Art (1996); and the Städelschule, Frankfurt (1995). Goodwin is a Professor at the Slade School of Fine Art. Select solo exhibitions and projects include Un-Earth, OCAT, Xian Museum (2018); Those Who Seek My Help, permanent commission for New Karolinska Hospital Stockholm (2018); Seeing Hand, commissioned through Launch Pad, Shanghai (2017); Unseen: The Lives of Looking, Queen's House, Royal Museum's Greenwich, London (2015); Skill, MIMA, Middlesbrough (2015); Poised, Ferens Art Gallery, Hull (2014); Wander, Bus Interchange, Cambridge (2014); Breathe, commissioned by Invisible Dust (2012); Linear, commissioned by Art on the Underground, (2010-2012); Coax, Raum mit Licht, Vienna & Fotoforum West, Innsbruck (2011); and Cast, Hasselblad Foundation, Gothenburg and the Photographers' Gallery, London (2008-09). Select group exhibitions include CLOSE: Drawn Portraits, Drawing Room, London (2018); Hooked, Science Gallery, King's College London, London (2018); Typojanchi, International Typography Biennale, Seoul (2017); Air: Visualising the Invisible in British Art 1768-2017, Royal West of England Academy, Bristol (2017); I want!, I want! - Art and Technology selection from the Arts Council Collection, Museum and Art Gallery, Birmingham (2017); Pose, Galerie Springmann, Berlin (2016); Stories in the Dark, The Whitstable Biennale, Whitstable (2016); Work, Rest and Play: British Photography from the 1960s until Today, curated by The Photographers' Gallery, London, touring China (2015-2016); Poster Art 150: London Underground's Greatest Designs, London Transport Museum, London (2013); Exquisite Forest, Tate Modern and Google, London (2012); and Poetry of Motion, National Portrait Gallery, London (2012). His works are held in private and public collections including The Museum of Modern Art, New York; Tate, London; The National Portrait Gallery, London; and The Science Museum, London. Maria Lassnig (1919-2014) was an Austrian artist. She attended the Academy of Fine Arts in Vienna during World War II. She was best known for known for her painted self-portraits characterized by fluid strokes of bright paint vividly suggesting the colour and texture of her own ageing skin, although the personas that she adopted were often extremely ambiguous. She was the first female artist to win the Grand Austrian State Prize (1988). She was awarded the Golden Lion lifetime achievement award at the Venice Biennale (2013). Lassnig’s work has been the focus of surveys at Hauser & Wirth, London (2017); Museum of Modern Art PS1, New York (2014); Halle für aktuelle Kunst, Hamburg, Germany (2013); Gallery of Contemporary Art, Montreal, Quebec, Canada (2012); Neue Galerie, Graz, Austria (2012); Friedrich Petzel Gallery, New York (2011); Museum Ludwig, Cologne, Germany (2009); Museum Moderner Kunst Stiftung Ludwig, Vienna, Austria (2009); Contemporary Arts Center, Cincinnati, Ohio, US (2011); Serpentine Gallery, London, England (2008); Hauser & Wirth, Zürich, Switzerland (2007); Museum für Gegenwartskunst, Siegen, Germany (2006); Sammlung Essl, Klosterneuburg, Austria (2005); Städelmuseum, Frankfurt am Main, Germany (2004); Kunsthaus Zürich, Switzerland (2003); and Centre Georges Pompidou, Paris, France (1994). Lassnig's work is held in the collection of the MOMA, New York. Michael Landy (b.1963, London) lives and works in London. Graduated from Goldsmiths College (1988). Select solo exhibitions include Scaled-Down, Thomas Dane Gallery, London (2018); Michael Landy. Breaking News, Sperone Westwater Gallery, New York (2017); Michael Landy: Breaking News-Athens, Diplarios School presented by NEON, Athens (2017); Out Of Order, Tinguely Museum, Basel​ (2016); Breaking News, Galerie Sabine Knust, Munich (2015); Saints Alive, Antiguo Colegio de San Ildefonso, Mexico City (2014); 20 Years of Pressing Hard, Thomas Dane Gallery, London​ (2013); Saints Alive, National Gallery, London (2012); Acts of Kindness, Kaldor Public Art Projects, Sydney (2011); and Art Bin, South London Gallery, London (2010). Select group exhibitions include Open for Business, Riga Bienniale, Riga (2018); In My Shoes: Art and the Self since the 1990s, Yorkshire Sculpture Park, Wakefield (2018); New Sculpture, Whitworth Art Gallery, Manchester (2017); Dizziness: Navigating the Unknown, Kunsthaus Graz, Graz (2017); Drawing Biennial 2017, Drawing Room, London (2017); PRIÈRE DE TOUCHER -The Touch of Art, Museum Tinguely, Basel (2016); Summer Exhibition, Royal Academy of Arts, London (2015); Reflections on the Self: From Dürer to Struth, Christie’s Mayfair, London (2015); ART Fahrenheit 415: Sailing Into The Sea of Oblivion, Yokohama Triennale, Yokohama (2014); Art under Attack: Histories of British Iconoclasm, Tate Britain, London (2013); and Edgelands - Prints by George Shaw and Michael Landy, The Fitzwilliam Museum, Cambridge​ (2012). His work is held in public and private collections including Arts Council of England, London; British Museum, London; Centre Pompidou, Paris; and the Museum of Modern Art, New York. Deanna Petherbridge CBE lives and works in London. She is an artist, writer and curator whose practice is centered around drawing. A major retrospective of her drawings was held at the Whitworth Art Gallery, Manchester (2016-17), accompanied by the publication Deanna Petherbridge: Drawing and Dialogue (2016). Her three professorships in drawing include the Royal College of Art (1995-2001), and she is the author of The Primacy of Drawing: Histories and Theories of Practice (2010). Recent curated exhibitions include Witches and Wicked Bodies, National Galleries of Scotland & British Museum (2013-15); and Artists at Work, The Courtauld Gallery, London (2018). Select solo exhibitions include Places of Change & Destruction, Drawings 2017, Art Space Gallery, London (2017); Deanna Petherbridge, Whitworth Art Gallery, University of Manchester, Manchester (2016); Petherbridge Alone with Soane, Pitzhanger Manor, Ealing, London (2007); and Two Cities: Two Modernities, Drawings by Deanna Petherbridge, Faculty Gallery, Faculty of Art & Design, Monash University, Melbourne (2003). Select group exhibitions include Journey with ‘The Waste Land’, Turner Contemporary, Margate (2018); Design & Research: Shared Territories, inaugural exhibition of the new Design Research Institute, Xi’an Jiaotong-Liverpool University, Suzhou, China (2014); Drawn Together: Artist as Selector, Jerwood Gallery, Hastings, UK (2014); and The Architecture of War, Imperial War Museum, London (2013). Paula Rego (b. 1935, Lisbon) lives and works in London. Rego trained at the Slade School of Fine Art (1952-56). She was appointed artist-in-residence at the National Gallery, London (1990). Her work has been exhibited in many of the major museums worldwide. She was awarded the Grã Cruz da Ordem de Sant'Iago da Espada by the President of Portugal (2004) and a museum dedicated to Rego's work, the Casa das Histórias Paula Rego, was opened in Cascais, Portugal (2009). Rego was made a Dame of the British Empire (2010). Her work is held in a number of public collections including the Arts Council, London; Berardo Collection, Lisbon; National Gallery, London; National Portrait Gallery, London; Tate Gallery, Liverpool; and the Whitworth Art Gallery, Manchester. Nicola Tyson (b. 1960, London) lives and works in Hudson Valley. Graduated from Central St. Martins School of Art, London (1981, 1989) and Chelsea School of Art (1980). Select solo exhibitions include Beyond the Trace, Drawing Room, London (2017); A Tendency to Flock, Sadie Coles HQ, London (2017); Paintings and Works on Paper, Contemporary Art Museum, St. Louis (2017); Works on Paper, Petzel Gallery, New York (2016); Living Dangerously, Cleveland Institute of Art, Cleveland (2016); “Goodbye/Hello”, Galerie Nathalie Obadia, Paris (2015); Trouble in Happiness, Susanne Vielmetter, Los Angeles Projects, Culver City (2014); and Nicola Tyson: Bowie Nights, at Billy’s Club, London, 1978, Sadie Coles HQ, London (2013). Select group exhibitions include Nudes, Sadie Coles HQ, London (2018); ISelf Collection: Bumped Bodies, Whitechapel Gallery, London (2018); Drawing Biennial 2017, Drawing Room, London (2017); Simon Denny, Sarah Morris, Joyce Pensato, Seth Price, Dirk Skreber, Hiroki Tsukuda, Nicola Tyson, Petzel at Nanzuka, Tokyo (2017); Artistic Differences, ICA, London (2016); Receipt of a Magical Agent, Center for Curatorial Studies, Bard College, Annandale-on-Hudson (2016); and The Nakeds, Drawing Room, London and De La Warr Pavilion, Bexhill On Sea (2014). Her work is held in public collections including Museum of Modern Art, New York; Solomon R. Guggenheim Museum, New York; Whitney Museum of Art, New York; San Francisco Museum of Modern Art, San Francisco; Walker Art Center, Minneapolis; Philadelphia Museum of Art, Philadelphia; Museum of Contemporary Art, Chicago; Corcoran Gallery of Art, Washington, D.C.; The Hirshhorn Museum and Sculpture Garden, Washington D.C; and Tate, London. Jessica Voorsanger (b.1965, New York) lives and works in London. Graduated from Goldsmiths College, London (1993); and Rhode Island School of Design (1987). Select solo exhibitions Jessica Voorsanger: Partridge Wear Collection, Binghamton University Art Museum, New York (2018); Secrets & Lies, TATE Film Club, Tate Modern, London (2017); Chain Reaction, Commissioned performance, TATE Modern, London (2016); EMPIRE Magazine, MASSIVE WINTER PREVIEW (Oct 2016, Issue 328), Kornhauschen Gallerie, Aschaffenberg (2016); Live Long and Prosper, WORK Gallery, London (2016); It’s Always About the Hair, Deptford X Commission, London (2014); Worldstaronestoppopshop, Kornhauschen Galerie, Aschaffenberg (2013); I Think I Love You, Lounge Festival of Love (commissioned installation), Southbank Centre, London (2014); Art Impostors, Louis Vuitton Maison, London (2011); and Eastenders, Whitechapel Art Gallery, London (2009). Select group exhibitions include Artists who do Music/Musicians Who do Art, Railway Club, Glasgow (2018); Exhibiting the Exhibition, Staaliche Kunsthalle Baden-Baden, Baden-Baden (2018); Empire II, The Age of Anxiety, Venice Biennale, Venice (2017); Gestures of Resistance, Dokumenta, Romantso Cultural Centre, Athens (2017); Imprint 93, Whitechapel Art Gallery, London (2016); FOUND, Foundling Museum, Curated by Cornelia Parker, London (2016); Liberties, Newlyn Gallery & The Exchange, Penzance (2016); and Factual Nonsense, Paul Stolper Gallery, London (2013). Her works are held in public collections including The Arts Council, London; and The V&A National Art Library, London. Virginia Chihota (b. 1983, Chitungwiza, Zimbabwe) lives and works in Podgorica, Montenegro. Studied Fine Art at Harare Polytechnic, Harare, Zimbabwe (2006) and BAT Visual Art Studios, National Gallery of Zimbabwe, Mbare, Harare, Zimbabwe (2004). Awards include the Prix Canson, Le Fonds Canson pour l'art et le papier, France (2013) and the Overall Award of Distinction in Textiles, National Gallery of Zimbabwe, Harare, Zimbabwe (2009). Residencies include Everyday, National Gallery of Zimbabwe, Harare, Zimbabwe (2007). Select solo exhibitions include Come Forth as Gold, Tiwani Contemporary, London (2016); A Thorn in my Flesh (munzwa munyama yangu), Tiwani Contemporary, London (2015); Isolation, Gallery Delta, Harare, Zimbabwe (2012); Relationships, Gallery Delta, Harare, Zimbabwe (2009); and Confluence, Greatmore Studios, Cape Town (2008). Select group exhibitions include The E-qualities of Women, National Gallery of Zimbabwe, Harare, Zimbabwe (2018); Prosthesis, Academy of Fine Arts, Vienna, Austria (2017); L'Autre continent: artistes, femmes, africaines, Muséum d'histoire naturelle, Le Havre, France (2016); Kin, Hangar - Centro de Investigação Artística, Lisbon, Portugal (2016); The Pistil's Waltz, Gallery 51, Antwerp, Belgium (2015); Speaking Back, Goodman Gallery, Cape Town, South Africa (2015); Pangaea II, Saatchi Gallery, London (2015); Shifting Africa: Artistic Views from the Sub-Sahara, 4th Mediations Biennale, Gallery of Jesuits, ARTykwariat, Poznań, Poland & Kunsthalle Faust, Hannover, Germany (2014); Giving Contours to Shadows (Unthinking the Chimera), Neuer Berliner Kunstverein, Berlin, Germany (2014); Prix Canson Exhibition 2013, Petit Palais, Musée des Beaux-Arts de la Ville de Paris, France (2013); Dudziro: Interrogating the Visions of Religious Beliefs, Zimbabwe Pavilion, 55th Venice Biennale, Italy (2013); A Terrible Beauty is Born, 11th Lyon Biennale, France (2011). Her work is held in public and private collections including Deutsche Bank Collection, Frankfurt, Germany; FRAC Picardie, Amiens, France; National Gallery of Zimbabwe, Harare, Zimbabwe; Saatchi Gallery, London; and Tate, London. Claudette Johnson (b.1959, Manchester) lives and works in London. Studied Foundation course in Art and Design, Manchester Polytechnic (1978-1979); BA Hons Fine Art, University of Wolverhampton (1979-1982); and Post Graduate Certificate in Education (F.E), University of Greenwich (1992-1994). Select solo exhibitions include Claudette Johnson, Hollybush Gardens, London (2017); Studio Show, Deborah House Studios, London (1999); Portraits from a Small Room, and residency, 98 Gallery, London (1995); In This Skin, The Black Art Gallery, London (1992); Pushing Against The Boundaries, and residency, Rochdale Art Gallery (1990); Claudette Johnson, The Tom Allen Centre, London (1990); Claudette Johnson - Recent Works, and residency,The City Art Gallery, Manchester (1986); and Claudette Johnson - Drawings, The Drill Hall, London (1984). Select group exhibitions include The Place Is Here, South London Gallery, London and Nottingham Contemporary, Nottingham (2017); Carte de Visite, Hollybush Gardens, London (2015); The Thin Black Line(s), Tate Britain, London (2012); Black Art Group, Gaves Gallery Museum, Sheffield (2011); and Transforming The Crown, Caribbean Cultural Center, NYC; Bronx Museum of the Arts, NYC; Studio Museum, Harlem, NYC (1998). Her work is held in public and private collections including British Council Arts Collection; Arts Council Collection; City Art Gallery Manchester; Graves Gallery Museum Sheffield; and Wolverhampton City Art Gallery. Joyce Pensato (b.1941, New York) lives and works in New York. Studied at The New York Studio School, New York (1970s). Select solo exhibitions include FORGETTABOUT IT, Lisson Gallery, London (2017); Make My Day, Petzel Gallery, New York (2017); The Fizz, Grice Bench, Los Angeles (2016); Joyce Pensato: Felix and Lincoln, Museum of Contemporary Art, Chicago (2016); The Godmother, Corbett vs. Dempsey, Chicago (2016); Later is Now, Kunstraum Innsbruck, Innsbruck, Austria (2016); FOCUS: Joyce Pensato, Modern Art Museum of Fort Worth, Fort Worth (2015); Later is Now, Capitain Petzel, Berlin (2015); Castaway, Petzel Gallery, New York (2015); Joyceland, Lisson Gallery, London (2014); and I Killed Kenny, Santa Monica Museum of Art, Santa Monica and Contemporary Art Museum St. Louis, Saint Louis USA (2013). Select group exhibitions include Knock Knock: Humour in Contemporary Art, South London Gallery, London (2018); Close: Drawn Portraits, Drawing Room, London (2018); Fast Forward: Paintings from the 1980’s, Whitney Museum of American Art, New York (2017); Painting Paintings (David Reed) 1975, Gagosian Gallery, New York (2017); We need to talk…, Petzel Gallery, New York (2017); MCA DNA: Riot Grrrls, Museum of Contemporary Art, Chicago (2017); Good Dreams, Bad Dreams: American Mythologies, Aïshti Foundation, Jar elDib, Beirut, Lebanon (2016); Outside the Lines: Rites of Spring, Contemporary Arts Museum Houston, Texas (2013); and Florence and Daniel Guerlain Donation, Centre Pompidou, Paris (2013). Her work is held in public collections including Centre Pompidou, Paris; Hammer Museum, University of California, Los Angeles; Museum of Modern Art, New York; and Whitney Museum of American Art, New York. Clifton Wright (b.1982, London) lives and works in London. Select group exhibitions include Close: Drawn Portraits, Drawing Room, London (2018); Fashioning Space, Victoria and Albert Museum (2018); Intoart Annual 2016, Percy Street London (2016); Intoart Annual 2015, Studio Voltaire London (2015); Practice Makes, Peckham Platform (2014); Verovisation, MAD Musée, Belgium (2011); No Soul For Sale, Tate Modern (2010); See the Revolutionary Art Exhibit, Whitechapel Gallery (2009); Different Spaces, Studio Voltaire (2007); and Animal Mineral Vegetable, South London Gallery (2005).